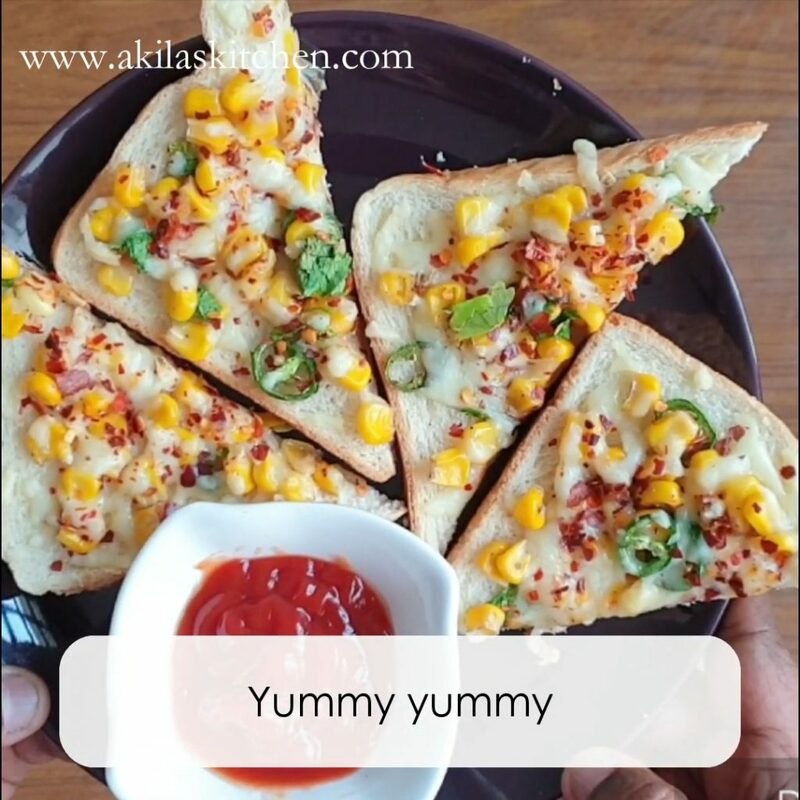 Sweet corn cheese toast is so simple yet tasty bread toast recipe which can be prepared easily within 5 minutes of time. Also it can be served as an evening tea time snack or as a morning breakfast. 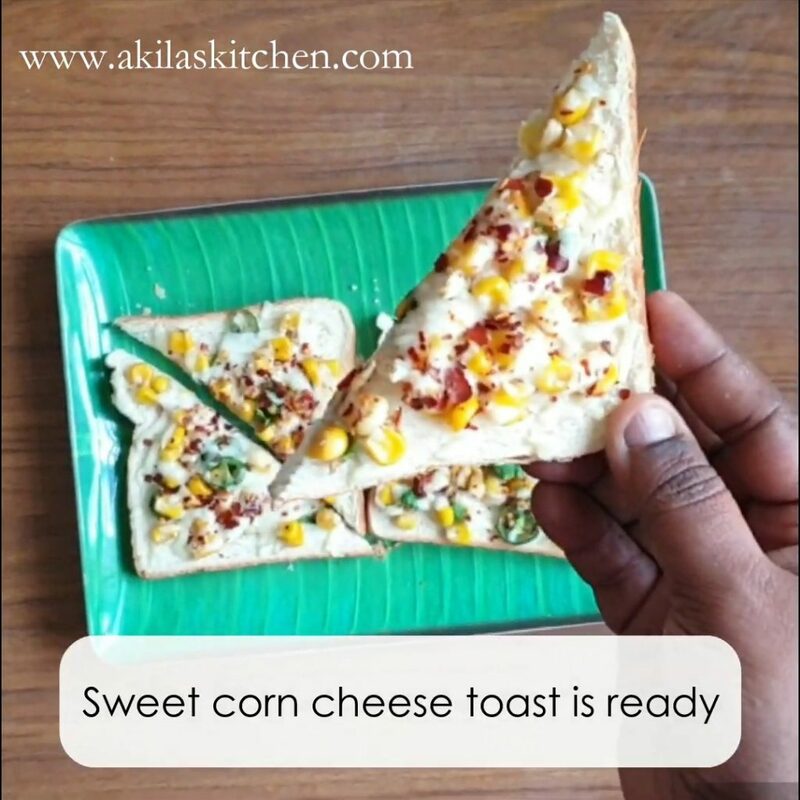 Sweet corn cheese toast recipe with easy step by step instructions and a video for your easy undestanding and learning. 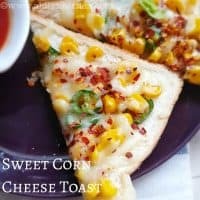 This sweet corn cheese toast is an another addition to my bread toast recipes collection as I always love to try different bread toast recipes. 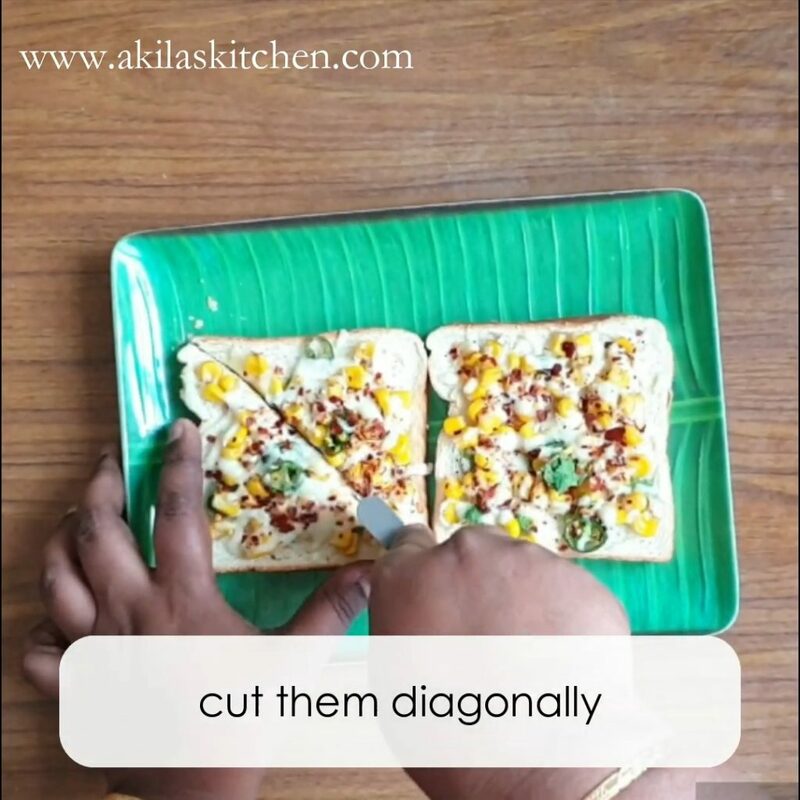 This toast is so simple yet tasty and needs not more than 5 minutes to prepare. Only toasting it takes some 8 to 10 minutes. 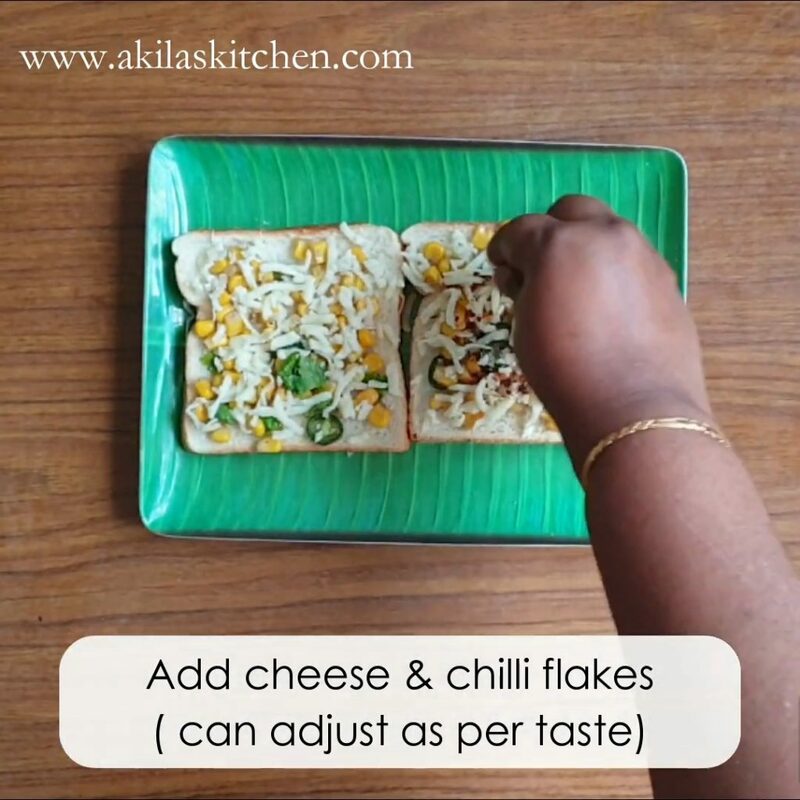 The addition of cheese and the addition of chilli flakes makes it more cheesy yet spicy. This combo gives the unique taste to this toast. 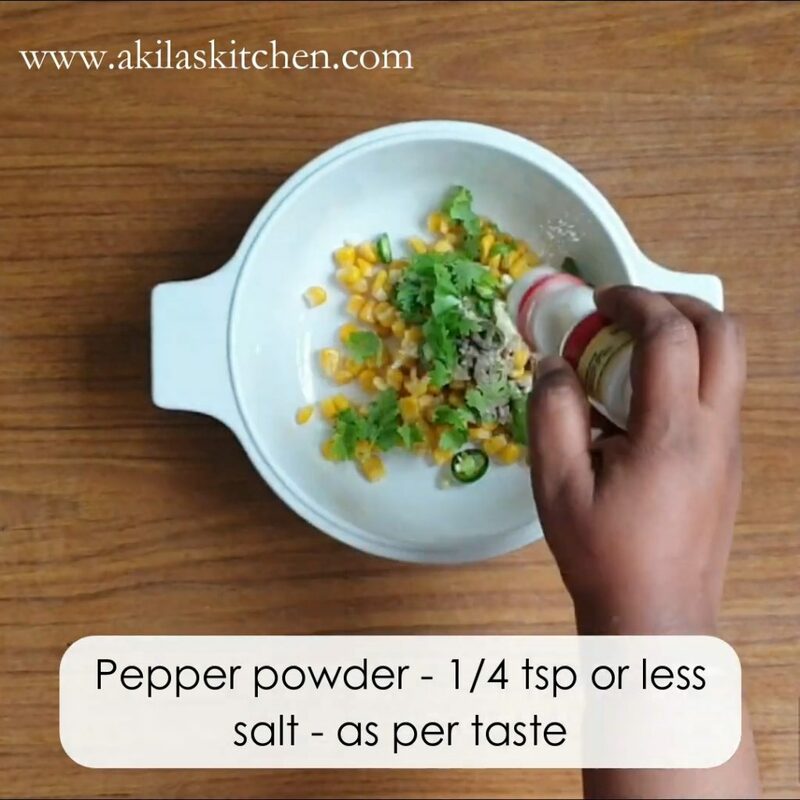 But if you are giving to kids, you can avoid adding the chillies and can give with just the black pepper alone. 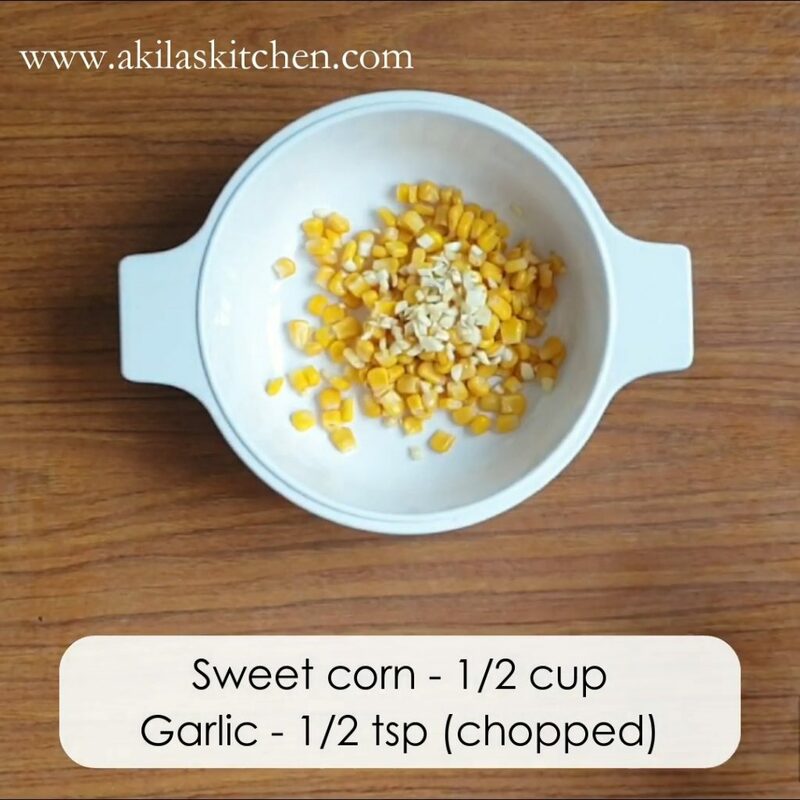 Also here if your sweet corns are very fresh, no need to precook them and can be added directly to the bread. But it its not that fresh, then it is better to cook the sweet corn and then use it. If you love my recipes, then do subscribe to my Youtube channel for latest videos. 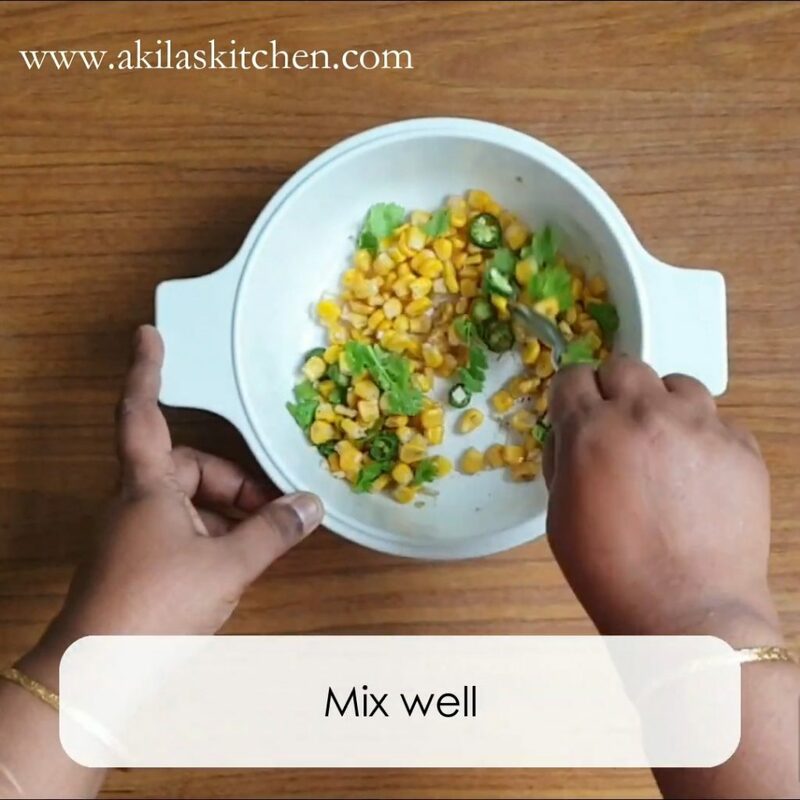 For Recipes in English – Akilas Kitchen and for recipes in Tamil – Just Samayal. 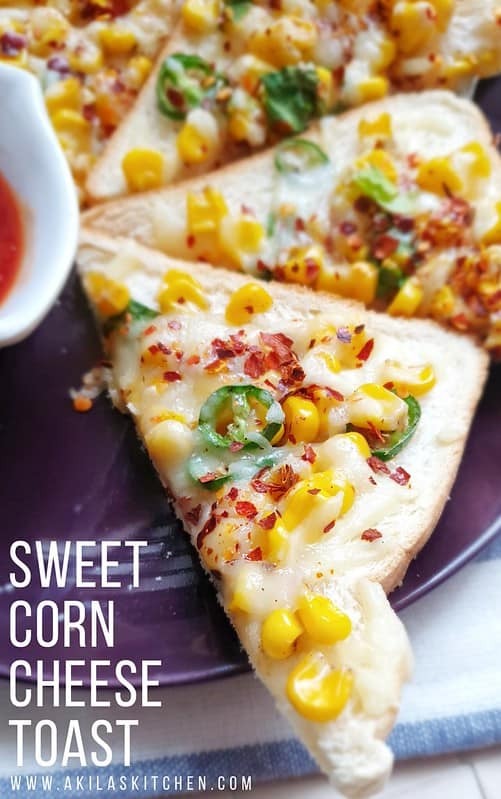 Sweet corn cheese toast is so simple yet tasty bread toast recipe which can be prepared easily within 5 minutes of time. 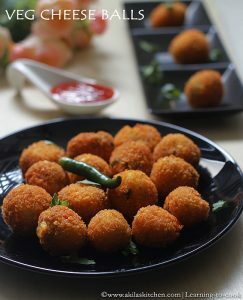 Also it can be served as an evening tea time snack or as a morning breakfast. This toast is so simple yet tasty and needs not more than 5 minutes to prepare. Only toasting it takes some 8 to 10 minutes. 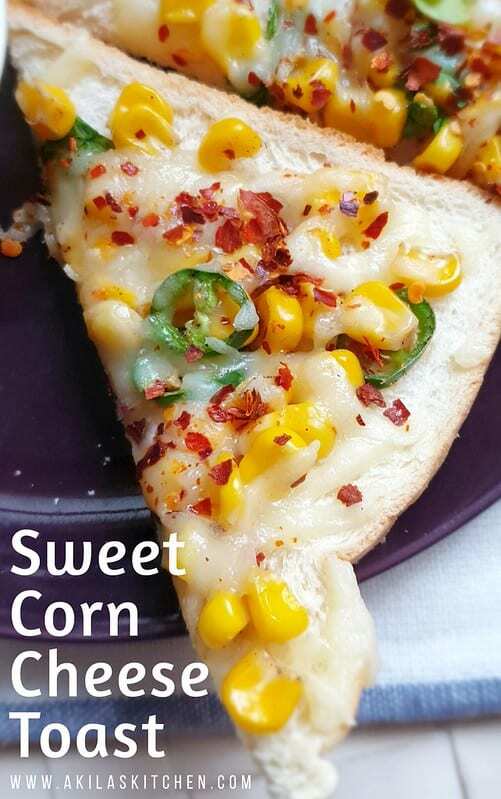 The addition of cheese and the addition of chilli flakes makes it more cheesy yet spicy. This combo gives the unique taste to this toast. add the cheese first, followed by chilli flakes. If you want you can add some italian herbs too like oregano, basil etc. Toast the bread in convection oven for about 8 to 10 minutes at 150 deg or until the cheese melts completely. Take out and cut them in to desired shape. I have cut them diagonally. 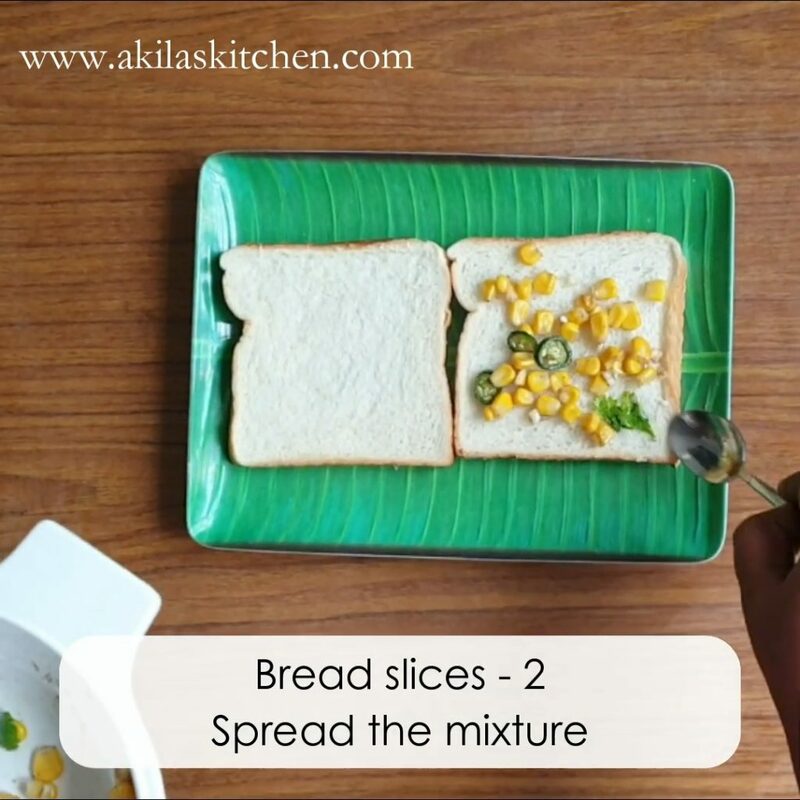 Serve the sweet corn cheese toast immediately with chilli sauce or tomato sauce. Tasty sweet corn cheese toast is ready. 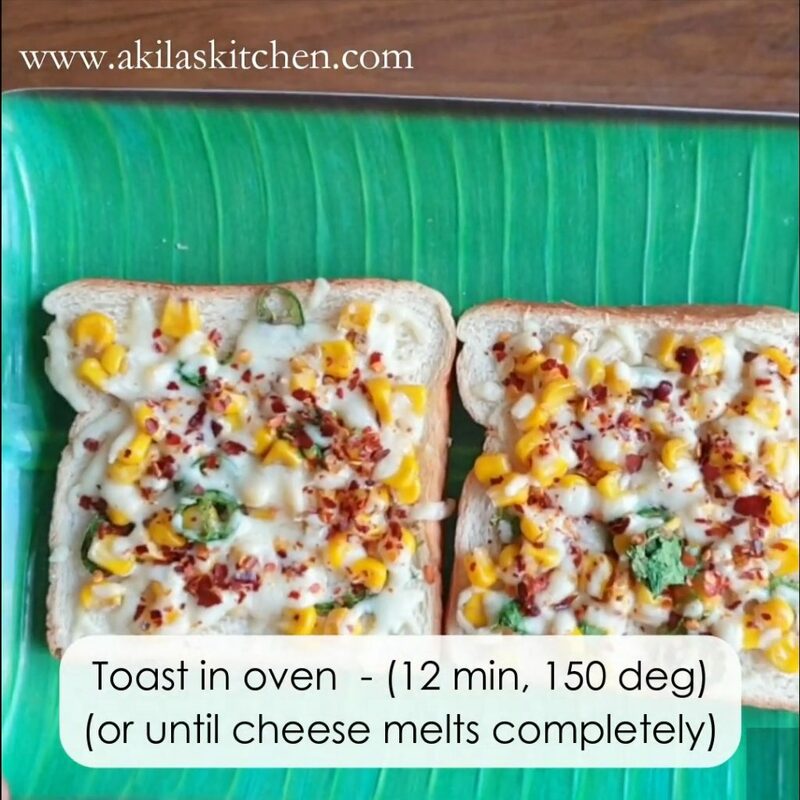 Add more cheese, as it gives nice flavour and taste for this corn toast. 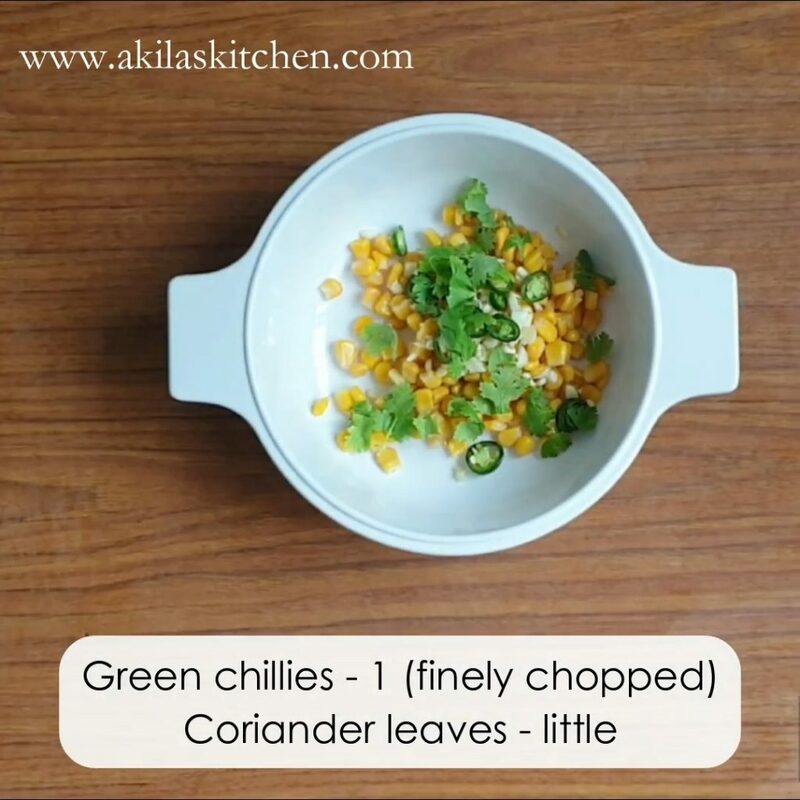 Adding chilli flakes is purely optional, but i recommend it as it gives a spicy taste. You can also some herbs like oregano, basil etc.